"Snap up a celebrity mug"
Have you ever fancied drinking coffee with your favourite celebrity? 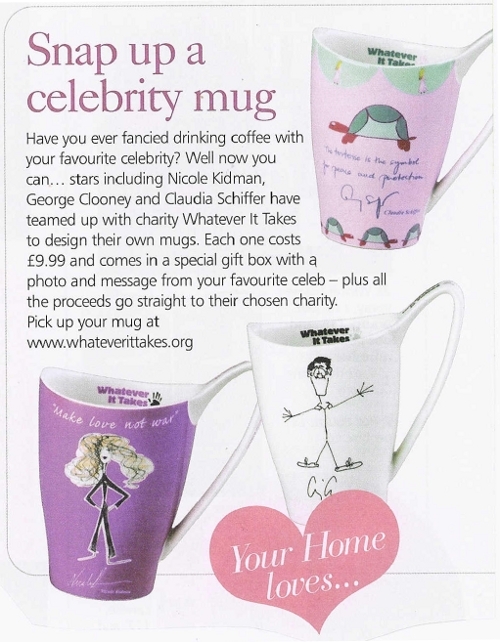 Well now you can...stars include Nicole Kidman, George Clooney and Claudia Schiffer have teamed up with charity Whatever It Takes to design their own mugs. Each one costs £9.99 and comes in a special gift box with a photo and message from your favourite celeb - plus proceeds go straight to their chosen charity. Pick up your mug at www.whateverittakes.org.